THE STORY - After an unprecedented series of natural disasters threatened the planet, the world's leaders came together to create an intricate network of satellites to control the global climate and keep everyone safe. But now, something has gone wrong: the system built to protect Earth is attacking it, and it becomes a race against the clock to uncover the real threat before a worldwide geostorm wipes out everything and everyone along with it. THE GOOD - The young Talitha Bateman upstages her adult costars with a good performance. Um...that's all I can think of. THE BAD - Unlikeable characters, a stupid plot, and ugly disaster scenes make for a terrible viewing experience. The first line in "Geostorm" is dreadfully ominous, both in the film and for the audience: "Everyone was warned, but no one listened." After a troubled production, Dean Devlin's directorial debut has arrived, and it's about as much of a disaster and you might've guessed. We were warned but of course, we did not listen and here we are. After climate change has wreaked havoc worldwide, a system of satellites was developed to combat horrific storm systems of all kinds. It's a successful project enacted by countries united from all around the globe, but the movie goes far out of its way to tell us that Jake Lawson (Gerard Butler) was the mastermind. 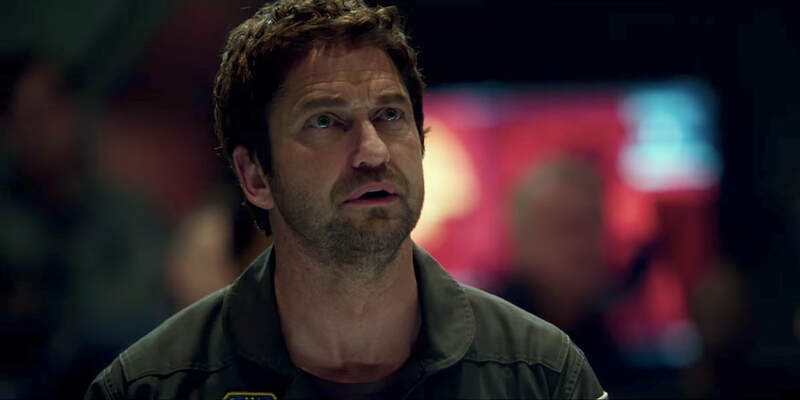 "Geostorm" picks up a few years after the project, when Jake's renegade personality gets him removed from his post. It's tough to tell if the filmmakers intended for his arrogance to be endearing or not, but I can assure you it's very off-putting. In fact, both Jake and his brother Max (Jim Sturgess) are so unlikable and give such stilted performances that we're left with no main characters to root for. Of course, before long, the satellite system begins to mysteriously malfunction, causing the death of thousands. By the way, the name they give to the system is, I kid you not, "Dutch Boy." The actors, in all seriousness, discuss the problems happening to the system by referring to it as "Dutch Boy" throughout this entire movie. It's quite hilarious. To help save the world, Jake is called back into service since he's the only one who can apparently. Soon they realize there is a political conspiracy to destroy most of the world, and it's up to these brothers to stop it. The thing one can usually count on in a disaster movie is that it'll have interesting effects showing the catastrophes around the world. I can not believe I'm saying this, but there's actually not that much disaster in this movie. Because it's about a satellite system that is threatening to cause a Geostorm, there's not actually a Geostorm in "Geostorm." There are a few disasters that start to occur as the system is malfunctioning and warming up, but it's not as much as one might think. And when we're given those precious interesting disaster scenes, the effects are really poor. This film is filled with special effects that look about a decade old. There's a scene that takes place during an intense lightning storm that's an all-out assault on the audience's eyeballs. It's a poorly animated car chase sequence with tons of debris, all while covered with the strobing lights of the lightning. It was for lack of a better word, exhausting. In many disaster movies, the spectacle of the film can make up for a silly plot. This is not so in the case of "Geostorm." Since there's not a lot of catastrophe in the movie, it's really trying to be a political thriller. Naturally, it fails spectacularly in that respect. The plot of this movie is preposterous, but it's given precedence over the action scenes. A third act "twist" was given away in the trailers, so most of the movie wastes our time looking for someone we know didn't start this conspiracy. I'm generally okay with disaster movies being dumb, so long as they can construct entertaining action sequences with charismatic characters. "Geostorm" has none of those things. Despite Talitha Bateman upstaging her adult costars with a good performance, there's nothing else here that is worthwhile.